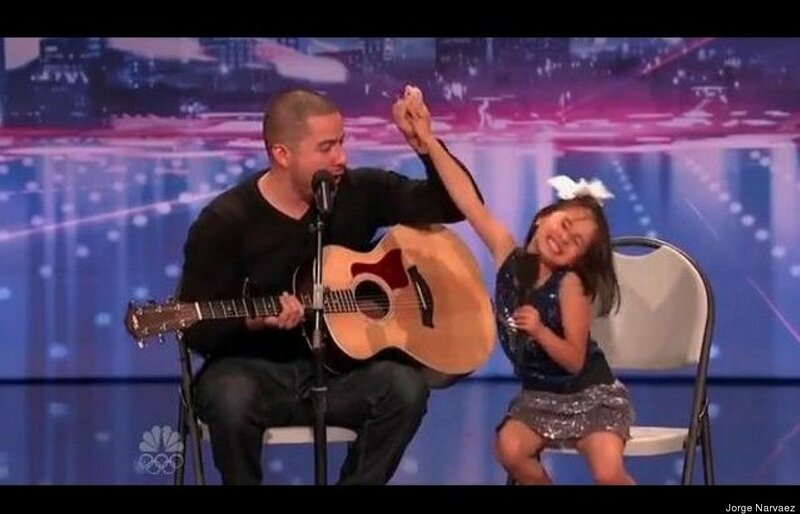 In 2010, Jorge Narvaez picked up his guitar and sang a song with his then 6-year-old daughter, Alexa, and shared their cover of Edward Sharpe and The Magnetic Zero's "Home" with the world on YouTube. Three weeks later, they had millions of views and became the new kind of famous only found on the internet. What you see is a loving father singing with his daughter -- what you don't know are all the struggles that Jorge, now 25, faced to get where he is today. "From middle school to high school, it was about literally about trying to stay alive from gangs, staying out of trouble and getting out of trouble. It was horrible. It was hard," says Jorge, who grew up in San Diego, where he and his family still live. In the summer between graduating high school and entering college, Jorge and his girlfriend Nancy became teen parents and had the now very spunky Alexa, and later, in 2008, their second daughter, Eliana. But first, in 2007, Jorge's mother was deported to Mexico. The family is still trying to get her back to the U.S.
"It took a toll on me spiritually, mentally and emotionally, and my grades and stuff. It tore me and Nancy apart. Till this day, I look back and think, 'Wow, I can't believe we made it,'" Jorge says. According the Census, in 2010 there were 1.8 million single fathers, 15 percent of all single parents. About 46 percent were divorced, 30 percent were never married, 19 percent were separated and 6 percent were widowed. In 2001, Jorge was barely getting by with a 1.3 GPA in high school, but he managed to turn it around, and graduated with honors and a 3.8 GPA. Most of this academic success, he says, is thanks to a foundation he helped start in the 8th grade called Reality Changers. The organization gives hard-working inner-city students the academic, financial and emotional resources to go to college. Jorge was an inaugural member. Reality Changers began in May 2001 with $300 dollars to its name and four 8th grade students near downtown San Diego, and now has given more awards to college-bound students than any other organization alone in the county since 2006, according to the organization's site. Jorge became the first person in his family to graduate college. Unfortunately, Jorge's story is not a very uncommon one -- but he says he has made serious changes that helped him become the father he is today. Just six months before his college graduation, Jorge became a YouTube sensation -- which changed the plans he had in store. "I didn't plan to do this, I was going to go to law school, I had my applications ready, I had my letters of recommendation, my grades were good enough, but I turned down my application because I thought, 'I can make a living out of this, I can make a living out of sharing my life,'" Jorge explained. Jorge and Alexa were invited to perform everywhere from "The Ellen Degeneres Show" to China, to a Hyundai commercial where they, of course, sang "Home." Their original heart-warming rendition of the song has received over 21 million views on YouTube. Recently, they performed on NBC's "America's Got Talent" and impressed the likes of judges Howard Stern, Howie Mandel and Sharon Osborne enough to be voted to go to Las Vegas. Fans anxiously await the outcome. But that doesn't mean Alexa fully understands how famous she really has become. "Fans came up to us and said: 'Oh, Jorge, we're going to vote for you,'" Jorge recalls, "and Alexa was like, 'Thank you! Thank you!' and then she turns to me and says, 'Dad's what's "vote?"'" Just because Alexa is the talk of San Diego, doesn't mean she doesn't have to clean her room. Despite the fame, Jorge is still humble and stays grounded with one focus in mind: his kids' well-being. "We've gotten calls from PBS and Nickelodeon but some of these contracts are so bad, they would take the life out of everything we do. I want to protect what we have. I am not trying to be the richest guy in the world, and I am not trying to exploit these kids," stresses Jorge. He has teamed up with Makers Studios, who help produce and edit his original content on YouTube and are helping him with his own music and writing. Although separated, Jorge and Nancy share Alexa and Eliana's parenting and communicate everything from what the kids do in school down to their daily diet. Jorge is a full-time dad 3 ½ days out of the week with school dropoffs, help with homework and making dinner. "We co-parent really well. We make sure to remind the kids that family is really important," Jorge explains. "Mom and I agree that we don't want them [Alexa and Eliana] to grow up and become Lindsay Lohan or Hannah Montana." With such a healthy perspective, fans might assume that Jorge's father was a positive influence, but his story is not what one might expect. "My dad was an abusive alcoholic. He is kind of my biggest role model, because I never want to be like him," Jorge says. "After years of struggling my mom got fed up and said, 'You know what, Mijo, we need to get out of here.'" Where does Jorge see himself in 10 years? Not surprisingly, he wants to become a singer. He also wants to be involved in leadership roles that benefit the Latino community, using his ethnic studies degree with an emphasis on international migration studies, visual arts and literature from University of California, San Diego. "I want to educate people about diversity and the importance of being a father and being there for your kids and continue advocating for Latinos, for people who are struggling in this country," Jorge says. Still, being a single dad can be difficult at times. He has trouble teaching his two girls Spanish because he learned from his mother, who still lives in Mexico. "I struggle to because I don't really know how to do it," he says. He hopes his kids will never one, struggle, and two, look down upon other people. "My mother always told me, 'Mijo, don't forget who you are, don't forget where you come from,'" Jorge says, a message he hopes his children will understand and carry with them in the future. According to Jorge, two important qualities for being a great dad are being "very patient," and "being able to deconstruct one's masculinity" -- the latter which comes especially handy when raising two little girls. As for clothing and fashion, that's where Mom steps in, because as Jorge said, "At the end of the day, they are girls and there is only so much a guy can do!"